Do you have a large opening like a porch or other wide opening? 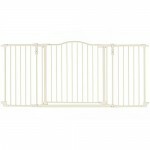 The North States Supergate Deluxe Decor Metal Gate offers perfect security for your child or pet. Constructed with a strong powder coated metal. Gate is wall mounted using only the toughest materials. Easily adjusts to doorways 37″ to 72″ wide over 6′, height is 30″. 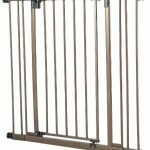 For added security, this gate offers one swinging walk thru panel built with a child proof double locking system and also has a stay open feature. 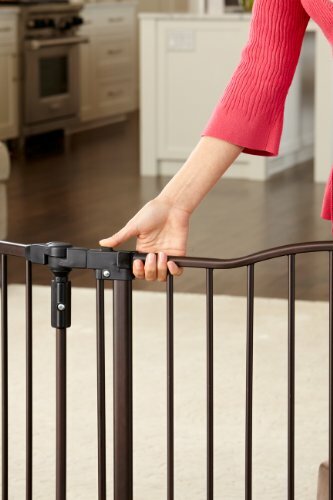 This proprietary safety feature allows you to easily enter and exit the play yard while keeping you assured that your little one can’t escape without your assistance. Or you can swing out of the way the entire gate with ease when not locked in place. This product will instantly complement any of your home’s existing decor. Item is espresso in color though it looks dark or like black. Q:Is this a pressure mounted gate with rubber bumpers? I don’t see the adjusting screws at the ends. Thanks. No, you screw it into the wall on the end pieces, top and bottom, both sides. I haven’t had any trouble with the screws coming loose from the wall. 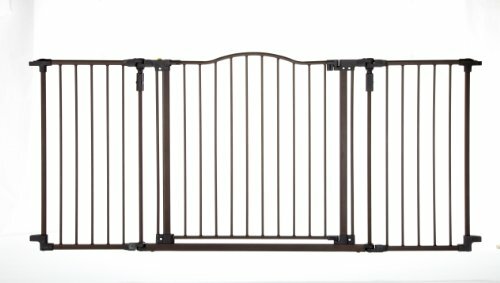 Q:How would I mount this gate in a hallway opening with baseboards at the bottom and straight to wall at the top? With baseboards, you just use the bracket as a guide, trace around the bracket with a pencil onto the baseboard and cut a notch out of the baseboard so that the bracket sits flush against the wall. This ended up being pretty easy to do. Q:Is this an indoor/outdoor gate or just to be used indoors? I am not sure what it was intended for but we are using it outside and so far it is holding up really well. We live in WA so it is fairly rainy at times. I actually want to buy another for the other side of the deck because this one works so well. Q:How difficult is it to open? Ideally, I want to allow my 8-yr-old to open it but keep a puppy behind it. I think an 8 year old would be able to open it. There is a button on top that you press while you lift and open the gate. My five year old doesn’t have the strength yet to press the button, but she understands the concept. You won’t have to worry about your pet figuring it out. Q:What is the length of each peice of the gate? Q:Do you have extentions for this gate? I have an 82 inch opening. No, it’s not designed to have extensions. It has hanges that allw it to be configured to fit openings less than the maximum described, if that makes sense. It can’t be made longer, however, to fit a wider opening than the maximum described. yes, I have my gate at a 90 degree angle. only thing is that you might want to anchor the gate into the floor with this angle, as it will make it not as steady with this angle. Nancy, if you haven’t already, check out the wider version of this.. the North States Superyard 3 in 1.. its 144″ and you can remove panels to be closer to 118″.. we just got it.. its fantastic. Q:I have a 68″ opening, will this gate fit straight across without bowing? I currently have this gate in a 60″ door way , And have been very happy with it. it curves out a bit because of its adjustable hinges. The hinges on either side of the gate opening, allows you to loosen and tighten, for bending the gate whichever way you need it to go. Since the gate is 71″ wide it will bend out or in on a 68″ doorway. Won’t be exactly straight. But it is made for this. I hope this makes sense.. It is about 2″ so should be perfect don’t see any breaking out unless you leave the gate open. Q:At the bottom of my staircase I have banisters on each side of stairs. Would it work to zip tie each side to the banister? No, it would not. You need a solid surface to anchor this gate. It is not a portable gate to move to different locations. Q:Is it possible to install such that the opening isn’t in the center of the width of the gate? I have a porch with stairs on one side, not centered. Actually no. There are joints on either side of the door that allows you to arc the whole system but not move the door. Q:If the gate is installed in a 60″ opening does it have to bow out in order to fit across the opening? Yes, it has to bow. There is no way to shorten it other than to have it bent at the joints. If the area around where you are going to use it is tight I suggest looking into a different gate. Q:Can I install the mounting brackets about 4″ off the floor to avoid the base boards? You could do that. We chose not to mount it above the base boards so our daughter wouldn’t be able to try to get under the gate. We mounted it to the base boards but had to add a small piece of molding to the wall for the top brackets since we mounted to the base boards. 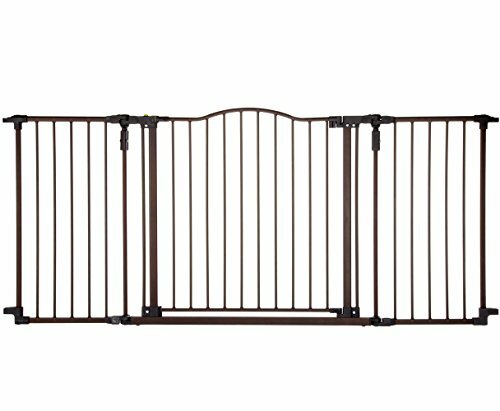 Q:Would love to hear opinions on using this gate for a 60 1/2″ opening to keep a Rottweiler from the windows in the front of our house??? I LOVE this gate. Granted, our dog is only 8 pounds but this is a very nice looking gate, it is very sturdy and screws into a wall or doorway so it looks like part of your home instead of a temporary solution. It does keep my 2 year old grandson out of our dogs area very well. If closed properly, it cannot be opened by a pet or child. It takes one strong hand or 2 hands to open it. I have been very pleased with it. Q:how do you get this gate OPENED? we had one day where it was pretty easy to open the door area with pressing on the button- now we can’t at ALL! HELP! 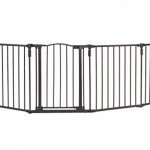 Q:I have a 72″ opening- I want a gate to go straight across not zigzag- will this work ? Thanks. yes it will but honestly having it go straight I find that it is not as strong and moves quite a lot . It works much better with the sides bent for stability. Q:can this gate be installed straight across with no curve? Yes it can be installed straight across.. It has adjustable bars to hold it in any position including straight. Hi there. It is a deep Bronze color, so dark brown, almost black is what you’d call it. I was worried at first, because all of my previous gates were white, but it looks quite nice. Beware that depending on the opening, it will actually bow out like a Bay window does. That’s what happened to my space. There’s no way to make it any smaller from the size it is. I actually like the way it looks, though, and where we have it, it doesn’t get in the way of anything. Q:How wide is the opening to walk through the gate?? Q:Is it possible to adjust the lower width narrower than the top to accommodate for my baseboards? No you cant. we drilled through our baseboards, we have wood putty on hand for when we decide to take it down to fill in the holes. my boyfriend made 1/4 inch thick pieces to fit on the top brackets to drill them to the wall so it would all be flush. works great. It only took him less than 10 minutes to make the pieces, and since they are sanded down they are the same shape as the brackets, so it all looks nice as well. Q:Exactly how long is this gate? The descriptions says 71″, but one of the answers mentioned 9 ft? Q:Would this gate work to block off a fireplace? Are the wall mounting points adjustable, or do the sides need to come out at a particular angle? Q:Is this a good gate for a small dog, such as a yorkie? Q:How much angle can the side panels be installed out, meaning: can the gate be positioned around a bottom step? The gate has brackets that have to be fastened into the wall. So as long as there is a flat surface for the brackets to mount to it should work at the bottom of a stairs. The side panels pivot where they are attached to the actual gate. So it depends on the width of your stair opening that will determine how much room you will have between the bottom stair tread and the gate. I hope that makes sense? Q:With being able to adjust the hinges at different angles, can I mount hardware on walls facing the same direction (west) and attach gate north/south? Hinges fully rotate-should not be a problem. Very pleased with our purchase. Q:What are the dimensions of the packaging? Aprox 27x32x6 Gate is in 3 main pieces. Q:will this gate be able to form a 90 degree or two 45 degree angles to go around a pellet stove? Yes you can angle it with 90 degree angles in a U shape as long as you secure it with the included screws. If you leave it unattached though it won’t stand on its own very safely. It will be a little top heavy. Also, there are some plastic parts to it in the joints and the latch so I don’t know how well it would withstand the heat of a pellet stove. Q:I have a dog that likes to chew on any gate we put up. Are the plastic connectors hard enough to withstand chewing? I have 2 teething retriever pups myself and they have gotten to them a few times when not being watched. They seem to be holding up pretty well so far. They are made of pretty dense plastic and have only sustained superficial damage (scratches and a deep gouge or 2). 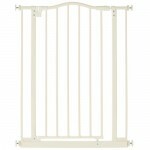 The gate itself is sturdy and solid metal, lightweight but durable. So far its holding up well. Hope this has helped. Q:I have a brick wall that this will need to mount to. Will this be a problem? It will need to be screwed in to the wall. I know it is not as simple, but is doable. Q:Can I use a 2-by-4 to add an inch or so? My opening is exactly 72″ and from the sound of it, I’ll need the slight adjustment…. Yes you can; I used a 1 by 2 on each side and it works perfect. Q:Are the hinges made of metal or plastic? What kind of warranty does it have? Q:Will it fit an opening that is only 45 inches wide? Q:does this gate have an accressory that can attach it to stair spindles? There was not a specific accessory to do that. Q:How many inches between slats?? Not sure. I am at work but can measure when I get home. Just guessing I would say 4″. Q:What are the shipping dimensions of the box? I don’t recall exactly, it wasn’t much bigger than the gate, which sits about 40″x36″ folded. Q:How wide is the gate door? Q:Can this be used on banister with a gate adapter? Q:Can it be mounted a couple of inches off (above) the floor? Hoping to find out if the two sides are mounted firmly that the gate is sturdy enough. It’s pretty solid. I believe it would hold up well. Q:Does this gate swing shut and latch…or do you have to pick up on it to get it to close??? It latches when closed. And yes you must pick up a little to open the gate. Overall this is a high quality product and very well built. Cosmetics are excellent too. Install took 25 minutes. Q:Anyone know why the gate does not close automatically anymore? Q:How important is it to make sure the gate is installed flush with the floor ? our floors aren’t perfectly level & we don’t have any issues w/our gate. Q:What is the distance between bars? I want to use with a small dog. Q:We have a 45 inch opening. Is this gate too big for it? I know it states that it will work, but not sure how it would look. I use this gate in front of french doors that are 60″ opening and it has to angle out on the sides to fit. I think this would be too big for your 45″ opening. Q:How do the mounts work against base boards? This is a question we should have asked and therefor did not mount it to our base board, only up on the top brackets. Still very secure. 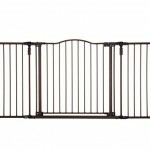 Q:could this gate fit around a fireplace? Q:How wide are the mounting brackets? I have to attach one side to our kitchen cabinets. The mounting hardware is about 1 1/2″ wide and about 3″ long. Gate is made very well. Q:How do you deal with the molding? Our molding is very small so we positioned the gate above it. My husband suggested if the molding is taller, get a small piece of wood the same thickness as your molding to put between the top screw and the wall. Q:hi can you tell me what the measurement of the gap is between the bars? Q:How wide is the gate? A: I have it between my livingroom and dining room and that opening is 63 inches wide. The gate extends another 4 inches on either side where it is attached to the wall. I used industrial double sided Velcro as I did not want to put holes in my walls. It’s worked great! Q:Will this fit a 52″ opening? Q:Where can i buy a second set of hardware? A: If you are buying this to replace the narrow gate with the wider one it comes with mounting hardware so you will have 2 sets if you want to mount the narrow gate and some panels in another location. Q:Can this be mounted in a hallway with baseboards, ie. are the top and bottom mounting plates adjustable? A: They are not adjustable, we have the rubber type baseboards at church and I had to cut part of the baseboard out to make it fit. You could probably make a shim for the top mounting plate. Q:Would this gate fit a 57″ space? A: Yes, it bows on either side of the gate opening so it will fit with a curve in it. Q:what is the spacing from bar to bar? Can a puppy fit through? Q:How does the gate attach to the wall? Do I have to use screws? A: I used them outside so I zip tied them to columns. They are at my Florida home so I can’t look but my guess is that yes there are screws to attach to walls. I will say the lock was very difficult to use. Pretty much had to have two hands to push the button down to unlock it. And even then, it was very difficult to push down. A: No just this gate. It is 71 inches long and hanging bracket is the other inch to make 72. This gate I s very nice and sturdy. Looks nice also. A: Depends on who you purchase it through. We normally can ship this in 2 days but we always allow for an extra day or two as a precaution. Q:Can this be used at the top of the stairs? The gate is 6 feet wide. Q:From the pictures of the product, it looks like the bottom mounts are a few inches up. Does anyone know if the baseboard problem been fixed? I bought mine this year and it has the “baseboard problem”. Pretty sure they have not changed the design yet. Q:I want to put this outside on our front porch at the top of the stairs. The opening is 48″ and it can’t bow out more than 6″. possible? You can have it bow out onto the porch and it will still look nice. I have mine on our porch also and I have it turned in so it bows inwards and it looks awesome. Q:Is this a tension mounted gate and if so does it stay in place securely? It is not tension mount. It is mounted to the wall with screws. It will stay secure with screws. I also have a tension mounted gate as well and it does stay pretty securely in place. Q:Can this gate be used outside? Or will it not hold up to outdoor weather? I am. It positive that it can be used outdoors or not. I would have to look at the material it is made from to see if it would withstand the elements. However if you only need it when you are outside, it can be easily completely taken down and stored inside. We have taken ours down when moving furniture around or having a Birthday party. Hope this helps. It is not a permanent fixture, which makes it nice. Q:I can not see where to contact the makers of this gate. I received my gate and it did not come with the parts to mount it on the wall. Where to order? Q:I need an extension panel because my opening is 89 inches wide. Is there an extension for this gate? None that I know of. It would lose its strength as it is built if there were. Q:For anyone who has used this outdoors, can you tell me if it is holding up OK to the weather? I live in Virginia. Thanks!! Sorry only use it indoors it appears like it would work outdoors but who knows if we have another north east winter like this one. We love it, works perfectly and very easy to open with one hand. Q:how heavy is this? i am using to keep 2 dogs seperated. A: It’s not super heavy, but strong enough to keep 2 dogs apart. My husky did learn to jump it, though, so it would depend on the size of your dog. A: We didn’t use any, and it doesn’t seem to cause an issue. But it wouldn’t hurt to use them, if you want it make sure it’s secure. A: Just measured to be sure…..the arch is 31″ from floor to top. Hope this helps. Q:is there any form of extensions? 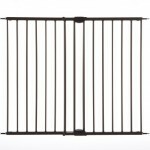 I am looking for a nicer looking gate but all seem to be smaller than 72″? A: Hi Michael-I’m in the same boat as my opening is 84″. This one is 84″ wide X 31″ high at $124.95 and you can purchase extensions. Little pricey for me though. Q:Is the expresso black or brown. I cannot tell. Q:We have an opening that has a slight angle. Will this adjust to that opening, or does it need to be set up straight? A: As long as the gate can clear the angle it should be good. Q:Is a drill required for installation? Does it leave a lot of holes in the wall after uninstalling? A: You will need to drill this in to the wall. 2 mount points per spot, 4 spots total. But you can remove the gate from the mount points and reattach it later. Holes are super easy to fix. Q:Is there any way to mount this without having to cut out the baseboard and mouldings? is there additional hardware i could buy? A: Yes! Absolutely. We didn’t cut out anything. All you need is 2 chunks of moulding wood (3-inch by 1/2 thick), to install the TOP two hinges. (Hardware store. Super easy.) The bottom ones will screw directly into your baseboards, so all you need for the top ones is to find something of equal width to compensate. It took us less than 10 mins. (And your mouldings are safe – too high to matter.) Good luck! Q:Is this product compatible with the 3-in-1 arched decor extra wide gate? We are interested in the possibility to connect the two. A: Do not know. I purchased item for a customer who chose another solution. The item was returned without being used. A: I’m sorry I don’t have that answer. I installed the gate in Arkansas and I live in California. The two side sections pivot so the whole thing can go from a hose shoe shape out to it’s maximum width. They can go from a 90 degree angle from the gate itself to almost straight across. Once in place the pivot points lock so they won’t move. I hope that helps. Q:How is this for outside use? It is not designed for outdoor use, so it’s hard to say how it would be. It’s very sturdy, but I can’t guess how it would hold up to weather. You might try to contact the manufacturer. Q:Our door opening is 48″ but we can’t have a gate that bows out into the room. Is there a way/option to make this gate work? You can install the gate to open either way. It has screws on both sides so you decide which way it opens when you install it. Q:Does this gate come with pressure mounts? If not, can they be purchased separately? I bought the gate and it did not have pressure mounts. It is screwed into the wall. It does not look bad. Has a nice looking wall plate. I absolutely love this gate! Q:Can the wall mounts be attached with adhesive rather than screws? Hard to say. If it were my child, I would say no. He is so strong he would probably be able to break it down with ease. This is a strong gate, don’t get me wrong, but he can shake it with ease. There is no adjustment for that, but if you are relatively handy it would mean 15 minutes with hacksaw, screwdriver and super glue. Q:The entry into the den is 69 3/4″. The left/right sides have 2 3/4″ base board with quarter round molding. How will the lower screw mounts be installed ? The only thing i can think of is since they are on pegs could you screw the brackets into the inside of the door frame? I use mine outside on my deck. I can say its the best gate ever! I bought two different gates, one for each side. I can’t wait until I need to replace the other gate, I’ll be getting another one of these. If you can make it work it’s worth it. The gate is as wide as it is. However, it can angle out at both joints to fill a varied space. No, you can not add or take out sections on this gate. Q:If you remove the 2 side pieces that go on each side of the center door panel, can that panel sit on the posts that are mounted for smaller doorways? No. The mounting points are on the 2 end pieces and they can not be separated. For the center piece there are knobs that allow you move the center out in an angular position or you can keep it in a straight line with the end pieces. Yes it does. If you open it all the way, it will stay open if you want it to, but if you’re just going through it, it swings shut. Q:Can I install it to attach to 2 perpendicular walls? I would imagine so. The brackets for the gate are only about 2″ wide so if there is room on the smaller face of the wall then it shouldn’t be a problem. Q:Can you use just one panel and the gate if you have a smaller opening to block? Hello, No it won’t work, but it does bend a lot so it might work. I can measure it bent if you’d like. Q:Can this gate be pressure mounted? No. It has to screw into a wall on both sides. It’s held up well keeping kids out of our office while looking good. Q:Will this work in a 4′-6″ opening, and will the door be positioned in the center? Q:Does this product have extentions available for purchase? No. It doesn’t. I just called the company to ask that question. The representative said that this gate isn’t manufactured to fit with the other superyard extensions. Q:We have a 60 pound energetic labrador. Will the bowed area of the fence prove to be too weak or wobbly and eventually fail with a dog jumping on it? I am not sure the gate is tall enough. The labs I had as a kid would probably be able to jump it fairly easily. I would not mount it elevated off the ground as the gate is heavy and will sag without the support. The actual corners lock and seem fairly solidly. It would hold a lab leaning on it and reaching over, but may not hold a full charge. It is wall mounted, so if you hit the studs well, it would probably work. Q:can I buy an extension? Q:will this gate be able to go around a pellet stove and attach to two different walls. It’s possible. It would depend on how wide the stove is, and how close the walls are to the stove. The gate itself is very flexible, so it’d just be a matter of whether the walls are close enough to each other to accommodate the gate. I’d measure carefully before purchasing. Q:Can this gate be used as an extension to the North States 3 in 1 Arched Decor Metal Superyard? Q:Are there any extensions that can be purchased? Our opening is about 92″, but I love the look of this gate! Love this gate! We did not need extensions and I didn’t see anywhere you could purchase them. Q:If you’d like to remove the gate temporarily, can you remove or lift it off the mounts? It is by the angle of the gate at either mid joint you can adjust the angle. The larger part at the top at the mid points are the tighten and loosen to adjust angles. Note: the wall connectors are not adjustable so if you have floor molding you will need a spacer at the top to make it work. I did this with mine and it works wonderfully. Spacer is the thickness of the molding. Q:How wide are the spaces between each rung? Hi Kalani, the average rung space is 2″ apart. There are two parts where it’s about a quarter inch larger, and a couple parts that are 1″. But most are 2″ apart. Q:Does the gate door swing both ways? Q:If my door opening is 195cm wide can this gate secure on both the side wall ? I can’t really answer that because I never set it up in my house because it was to big.